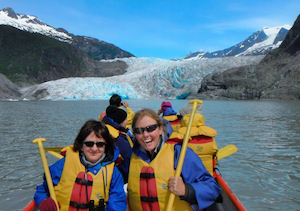 Be among the select few under a limited U.S. Forest Service permit to travel by canoe for an unprecedented experience near the face of the majestic Mendenhall Glacier! Paddle across Mendenhall Lake, navigating past icebergs, surrounded by one of the richest samplings of Alaskan wildlife you'll find anywhere. Birds, including arctic terns, nest in the towering cliffs, and eagles, goats, salmon and bears are all common sights. Then, venture within a safe distance of the massive, awe-inspiring face of the living Mendenhall Glacier. Grab a thrill ride by skirting the base of beautiful and powerful Nugget Falls, as well! You can even refuel with a snack of Alaskan-style fare for your return. You will make the trip in a traditional Tlingit-syle canoe, an exceptionally stable 28 foot watercraft, with all modern safety gear supplied. Because of the close approach to the glacier face, the Forest Service tightly controls the number of participants - Be sure to secure your space now! Moderate to good physical condition is necessary for participation in this excursion. Children must weigh at least 40 pounds in order to fit into required life jackets. Children 12 and under must be accompanied by an adult. Unaccompanied children between the ages of 13 through 18 must have a waiver signed by their parent or guardian. This tour operates under a Special Use Permit issued by the US Forest Service. You will spend about one hour on the canoe trip across Mendenhall Lake, stop ashore for a snack near Nugget Falls and then paddle back across the lake for about 50 minutes. Some final notes: bring your vouchers and dress comfortably for the weather (if your tour is on the water it will be about 10 degrees cooler). Camera and binoculars are suggested for land-based tours. However, while on tours involving rafts, canoes and kayaks, we suggest you bring disposable cameras.